Every once in a while we come across innovative solutions that have power to transform lives of millions of people living in rural India. However, we hardly see any of these innovations actually get implemented due to lack of support, funds or resources. Bihar Innovation Forum (BIF), an initiative of the Government of Bihar supported by the World Bank, is one of a kind platform that will identify, support and fund such innovations. The innovative solutions that come through BIF will be implemented by the Bihar Rural Livelihoods Promotion Society (JEEViKA) in collaboration with the State Innovation Council. 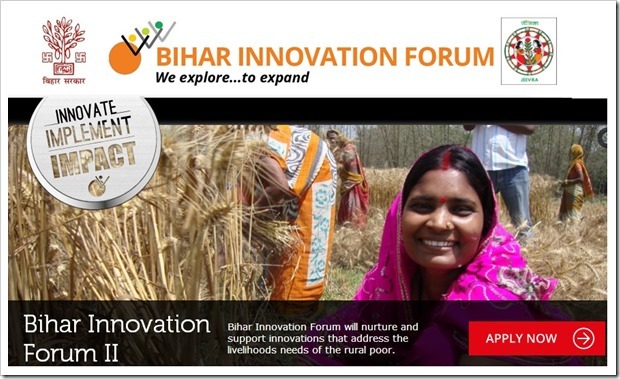 The registrations for Bihar Innovation Forum are currently open and applications are being accepted for innovative solutions which belong to one of these 8 themes: Agriculture, Livestock, Financial Services, Rural Energy, ICT Based Solutions, Skill Development & Non-Farm Sector, Access to Entitlements, Access to Services. You can see more details on BIF here. Winners of BIH initiative will be provided with range of support services including financial and implementation support and linkages to other partners like investors, foundations, mentoring and incubation agencies. Every state needs to come up with such initiatives, because far too many disruptive innovations never see the light of the day due to lack of support. This is especially true in case of innovations that are targeted towards bottom of the pyramid. It is encouraging to see that in recent times, policy makers at state and centre are coming up with initiatives and schemes that facilitate Public-Private partnerships by bringing together innovators and various support agencies and investors. The last date for receiving applications for the Bihar Innovation Forum is June 10th, 2013. Shortlisted applicants will be informed of onsite due diligence schedule by June 30, 2013. Winners and awardees will be informed of their selection by July, 2013. If you have an innovation that you think can change lives, go ahead and apply here now! I wrote a letter to the BIF,no reply at all. This is INNOVATION in Bihar !